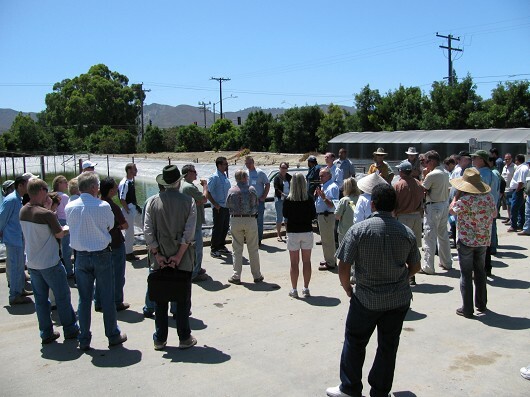 Don Merhaut of UC Riverside describes plants suitable for vegetated filters at the Hansen Ag Center in Santa Paula. 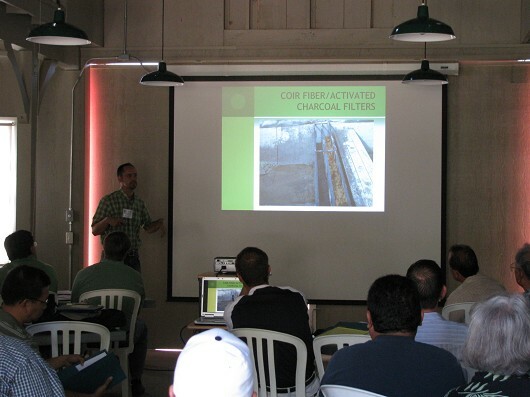 Darren Haver of UCCE Orange County describes a vegetated filter strip project using Canna lilies. 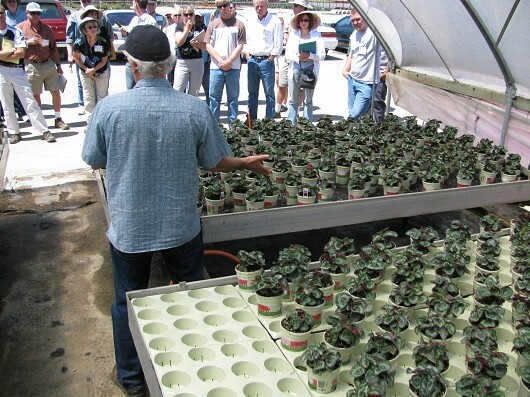 At DoRight's Nursery in Santa Paula, Richard Evans of UC Davis demonstrates a capillary mat system for reducing runoff. 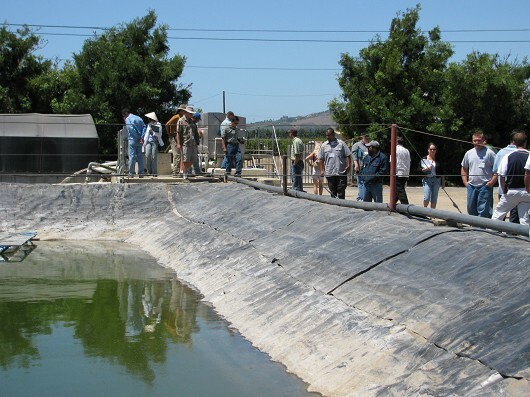 Tour participants get a closer look at the capillary mat system. 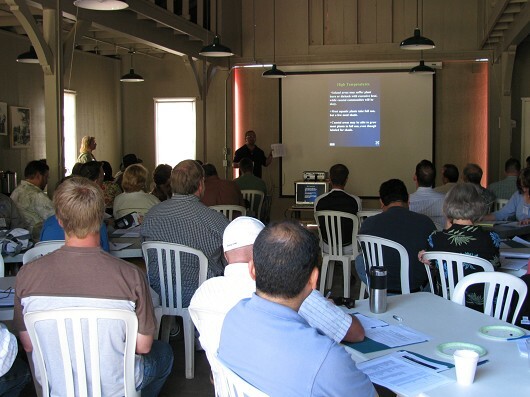 Dudley Davis, of DoRight's Nursery in Santa Paula (with microphone), describes his system for capturing and recycling irrigation water. 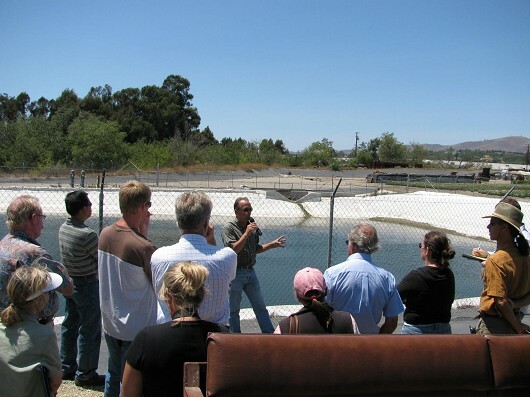 Tour participants get a closer look at DoRight's collection basin. 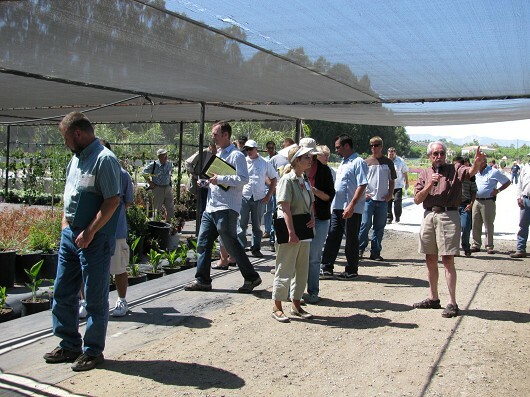 After lunch at Bordiers Nursery in Somis, tour participants set out to view their vegetated filter strip system. 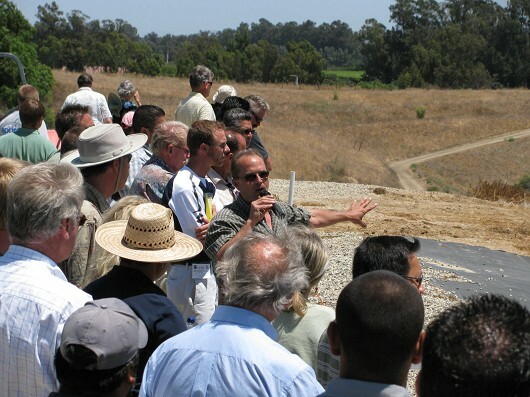 Gene Arthur of Bordiers shares his experience with vegetated filters for reducing runoff from the nursery's property. 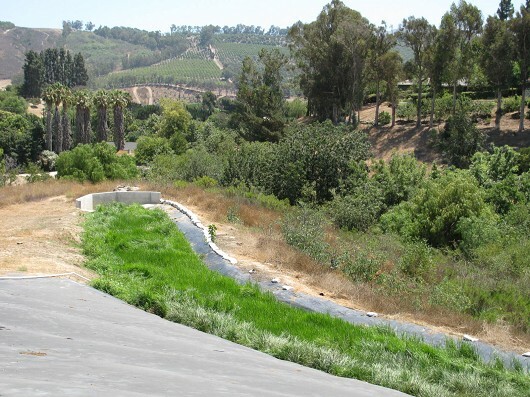 Bordiers grass-filled drainage path effectively reduces runoff with little maintenance beyond occasional mowing. 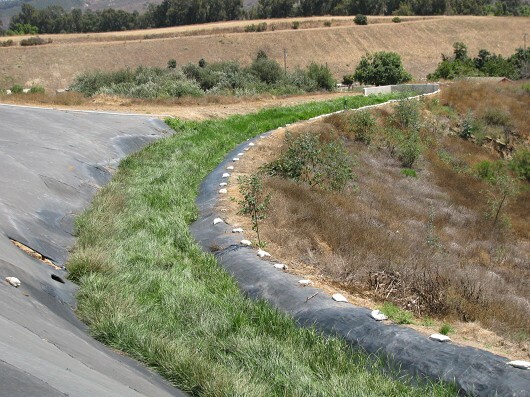 Another view of the vegetated filter strip at Bordiers Nursery, Somis. 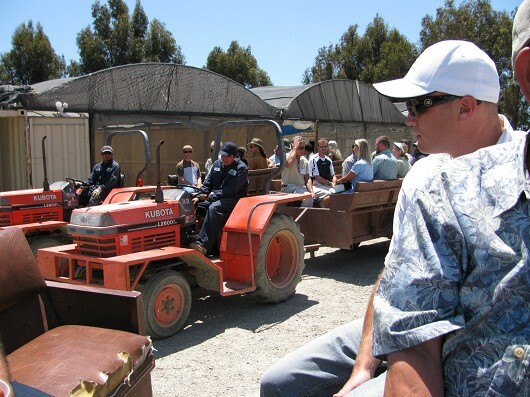 Bordiers' Gene Arthur describes the benefits of their recycling system including overwintering water fowl in the collection basin. 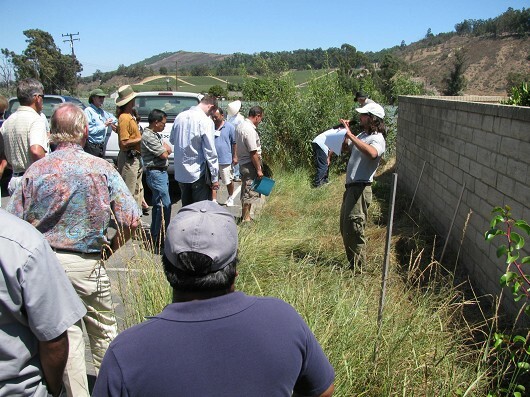 Casey Burns of the Natural Resource Conservation Service demonstrates a small scale vegetated strip for filtering drainage at the Ventura County Resource Conservation District office in Somis. 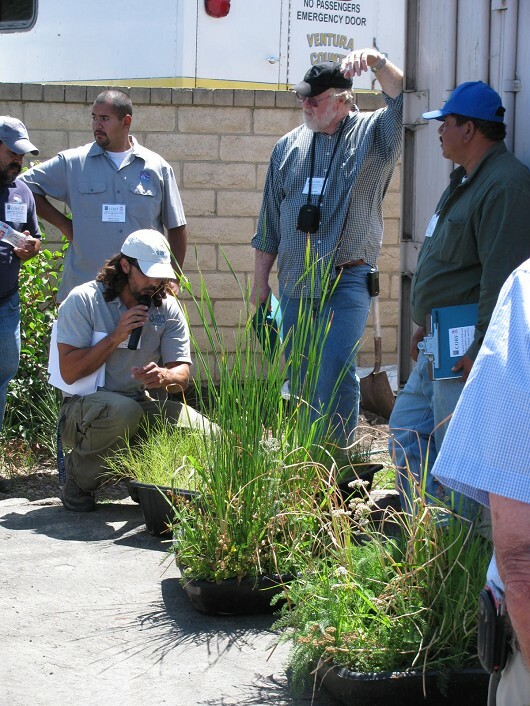 Casey Burns shows some examples of plant species combinations that work well for small-scale vegetated filter strips. 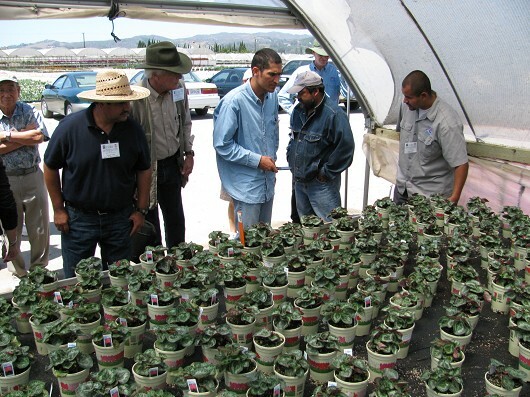 Ron Farland of Plants Plus Nursery in Somis (with microphone) explains the layout of drainage channels and how they can accommodate container plants to absorb and reduce runoff. 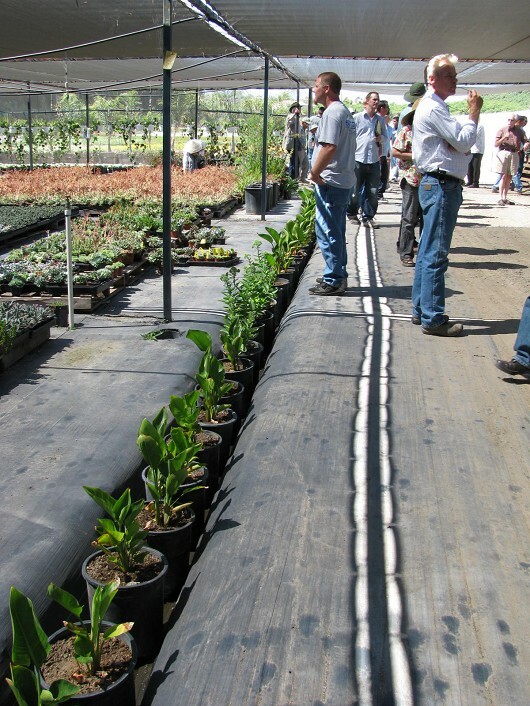 A drainage channel at Plants Plus Nursery filled with Canna and Sedum plants to intercept runoff.